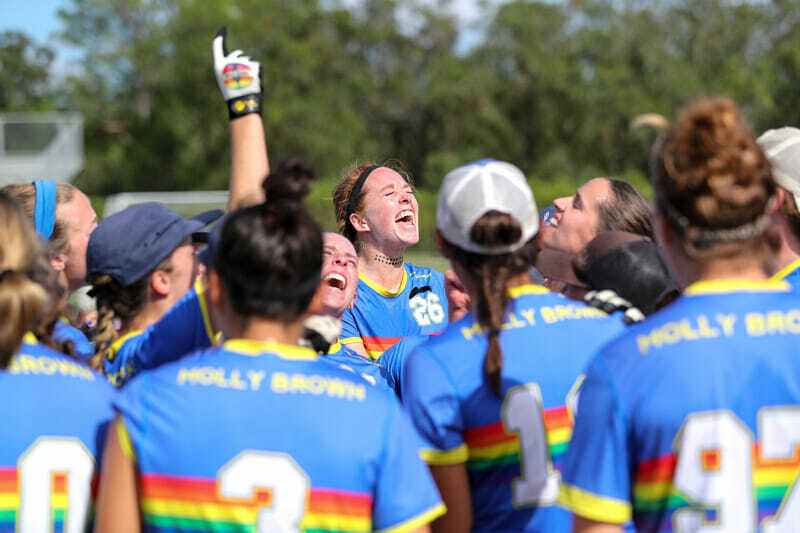 With all the chips on the table, Denver Molly Brown proved themselves unsinkable, edging out Washington D.C. Scandal 13-11 to advance to the semifinals where they will face Boston Brute Squad for the third straight year. Scandal played their best game of the weekend when it counted, but they couldn’t impede the pace of Molly Brown’s stars, nor could they contain their deep bench of contributors. Molly Brown walked onto the field as the comfortable No. 3 seed overall, three pool play wins tucked in their back pockets, and miles of potential ahead. Scandal, on the other hand, ended pool play with an embarrassing loss to San Francisco Fury. They couldn’t put the pieces of their offense together, and their defensive efforts bounced off Fury’s players like traffic cones in front of a freight train. Scandal managed to keep the Toronto 6ixers at bay in prequarters, but nobody was betting on Scandal headed into the quarterfinals. Except, of course, Scandal. Denver tore the game open with an early 3-1 lead. Molly Brown’s usual suspects—Claire Chastain, Paige Applegate, and rookie Sarah Pesch— pushed the game’s tempo and slid low breaks past defenders. Scandal’s zone limited some of Molly Brown’s options, but Denver’s first five offensive points were turnover-free. Molly Brown broke to reach 6-3, and spectators wouldn’t be blamed for wandering away in search of closer games. Scandal refused to let Denver seize the game. They held upwind after Molly Brown fumbled a force middle defense. Their D-line surrounded the Molly Brown handlers with an active trap cup, and they had a perfect conversion rate through three breaks to take the lead 7-6. Molly Brown tied the game at 7-7, but despite a marathon point with myriad turnovers, Scandal held for half on Sandy Jorgensen’s third goal of the game. Jorgensen had a quiet if not disappointing game against Fury, but in the quarterfinal she was monstrous. Molly Brown had to redefine their defense to account for her presence downfield. Denver set a zone of their own on Scandal in the second half to push them into the windy sideline, and it earned them one break early —a break made possible by a nearly full-field backhand from Jesse Shofner to Lisi Lohre. The teams traded efficient holds to 10-10, and the game would be Scandal’s if the pattern continued. You could call what Jesse Shofner did next magic. You could call it unbelievable. You could even call it the product of years of training and hard work if you were so inclined. However you describe it, there’s no denying that with her team’s fate on the line, Shofner decided to fly. Scandal’s Jessie O’Connor ripped a note perfect backhand toward Jorgensen in the endzone. With her defender on her back hip, Jorgensen set up perfectly for another goal. Shofner could see the play developing yards in front of her. She turned the jets on enough to close the gap and launched herself just far enough to shut down the play with a flying layout block. Molly Brown’s D-line powered the disc upwind and Shofner shot a backhand to Chastain for the break they badly needed. “When your teammate makes a huge play like that, you know you have to clamp down and value the disc through possession,” Chastain said about Shofner’s play and the eventual break. The play was enough. Molly Brown rode that momentum through the final points of the game, until the very last Chastain huck to Sam Peletier for the win. Comments on "Shofner Block Pushes Molly Brown Past Scandal To Semis"